The queue at the ticket counter was fairly long enough, and moved very slowly. Two counters were opened, and both the counters were moving at the same pace. My train was still over an hour away, and I stood leisurely. A few notices (written entirely in Tamil) informed that Vaigai Express would depart from Kudalnagar Station instead of Madurai Junction due to some track works – the railways chose to put a handwritten note in Tamil – there was no English version anywhere in sight! The queue inched forward slowly, and it was now my turn – “Two tickets to Rameswaram, in Express, Sleeper Class”. The person at the counter replied that they do not issue sleeper ticket. I was accompanied by Jayasankar on this trip – we walked into the platform after getting the ticket. The platform was crowded even at this point of time – we slowly walked towards the Dindugal end of the platform. As we started walking, the Anantapuri express to Trivandrum slowly rolled in (This one had a WDP4, IIRC). The coaches were all crowded – the boards indicated an RSA with another train (Rameshwaram express). A while after Anantapuri went, Podigai express came in. After Podhigai, Nellai came in. The platform was busy at all points of time – there was heavy action all the while. An unknown train came from the Tirunelveli end – there was no announcement. Since both of us had very little idea of the layout of the station (and the alignments) we were a bit concerned if it was our train – but it later dawned on us that it was the passenger from Kollam. In the meantime, we had tea and some vada from a stall on the platform. We also bought our breakfast packets from there. The Rameswaram passenger was getting ready on another platform – the train was already packed to the core. Our train, 16779 Tirupati – Rameswaram Express came in a bit late, at 0620hrs, behind Golden Rock WDM2 #17711. The first thing that caught my eyes as the train rolled in was that almost all coaches were more-or-less empty! We decided to get into the coach that comes right in front of us – and that was S6. The entire coach was empty, and we had the option of choosing our seats – we chose a 6-seater bay with the emergency window. As the train was waiting, a vendor from a restaurant in Madurai came about selling breakfast – we decided to try that out as well – I forgot the name of the restaurant, but the food was finger-licking-delicious. The train got moving at 0640hrs – we were almost 40 minutes late now. 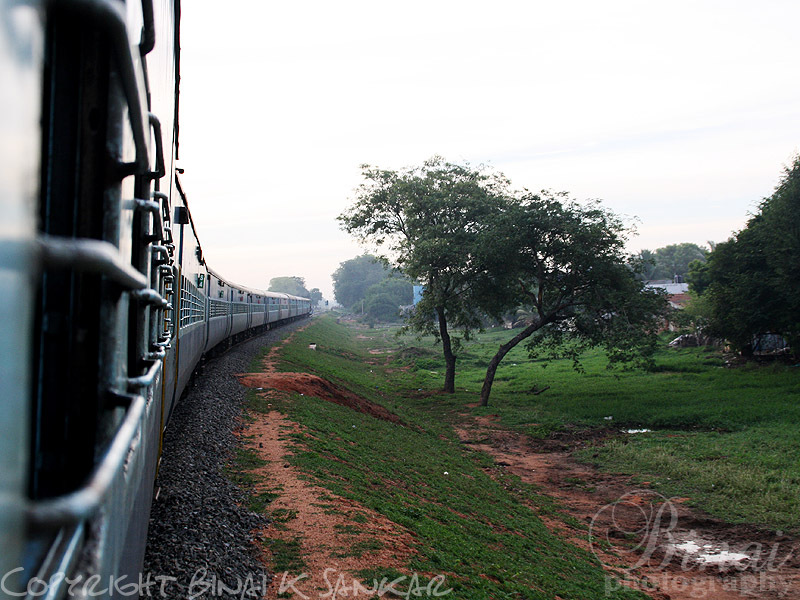 As the train started off from Madurai.. The line to Rameswaram veers off the main line immediately after the train clears the station limits. The line resembles a typical MG line – the clearance and surrounding areas all still retain the MG charm. 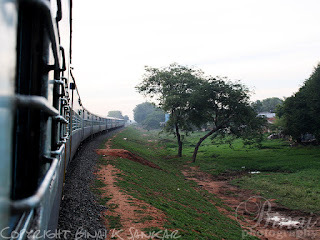 The train slowly picked speed as we progressed towards Rameswaram. Both of us were busy finishing our breakfast – while the TTE came around asking for our tickets. On seeing the unreserved II class ticket, he “threatened” us that he’ll levy a charge – both of us smiled and replied, “How much?” The TTE was bewildered, confused, stunned and the expression on his face was priceless – the poor guy perhaps was expecting us to pay him something or plead ignorance and move to the other coach. He fumbled for words, and said he’ll come later. We had a hearty laugh on this, as we enjoyed our breakfast. We crossed the Rameswaram-Madurai passenger at an unknown station (the loco in charge was WDM2 #18554 of Erode). Our first halt was at Manamadurai. There was a DEMU lying on the other platform line at this huge station. The TTE finally came to us, and collected the difference in fare and issued a receipt for the same. The run after Manamadurai was largely uneventful. The train ran at a steady pace all the time – the landscape changed rapidly and signalled that we were approaching coastal area. There were less of coconut palms and more of oil palms and fruit (Palmyra) palms. The terrain too changed, and the area had more of dry sand than soil. We had the first glimpse of the sea as we neared Mandapam. 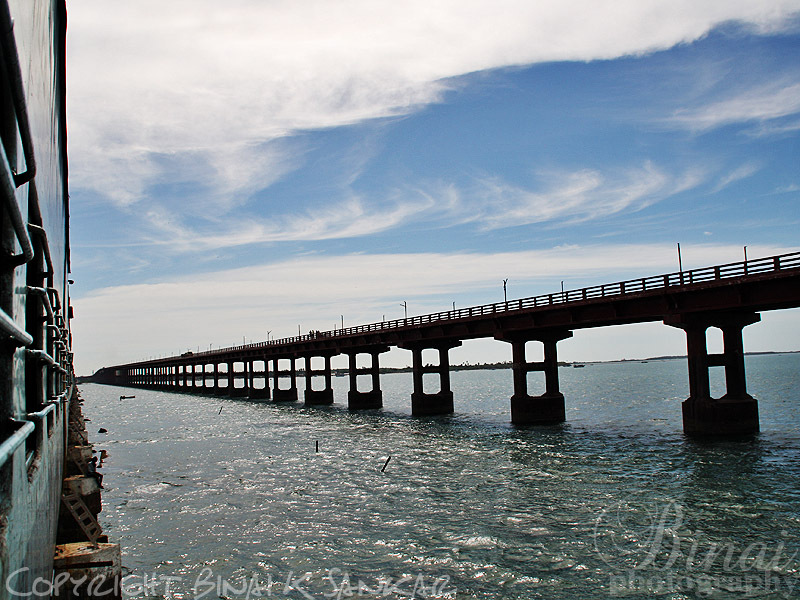 The sea first gets visible on the left side (while travelling towards Rameswaram). 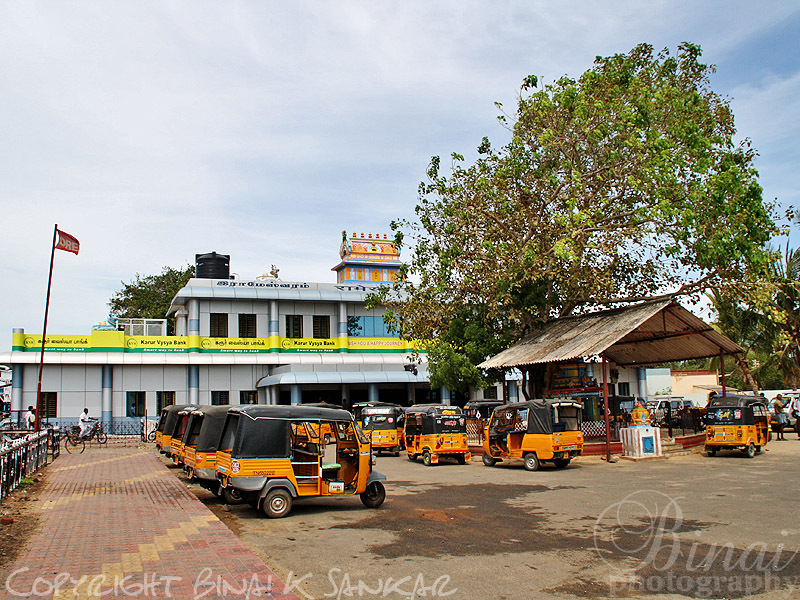 We reached Mandapam at 0908hrs – we were over an hour late according to the schedule. The halt at Mandapam was brief. As we left Mandapam the sea got visible on both the sides – the road runs parallel to the tracks as well. So the land gets narrower and the train slows down rapidly. We slowly trundled our way on to the bridge – this was a prized moment – a moment that I had been waiting for a really long time. 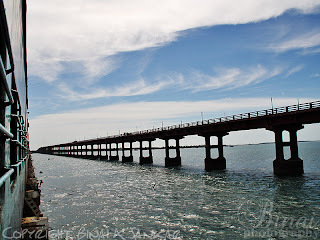 We got on to Pamban bridge at 0919hrs. 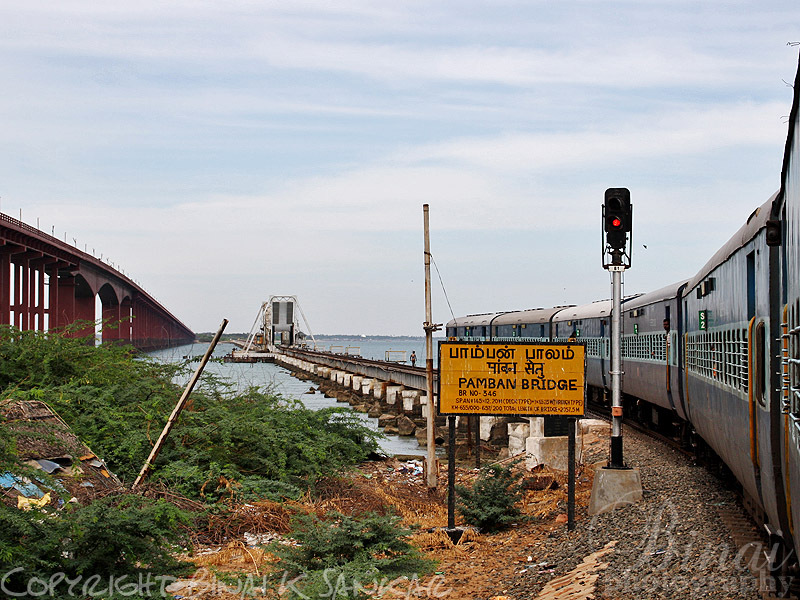 The train slowly crawled its way towards Rameswaram – on India’s only bridge crossing the sea! The bay was green in colour and very attractive unlike the brackish colour seen in the Arabian Sea. Fishing activities was at its peak – lots of people with nets, standing on the bridge’s rescue shelters or on row boats. Some people were angling sitting on the pillars of the bridge too. We exited the bridge at 0927hrs – 8 minutes to cover a shade over 2kms – you can imagine the speed the train maintains on the bridge! That is the road bridge running parallel to the train bridge. After the bridge, the train passes through an area that closely resembles a desert – its sand dunes all around. The sidings at Pamban station was all mired in sand. The train picked up speed after Pamban. The road still runs parallel to the tracks. 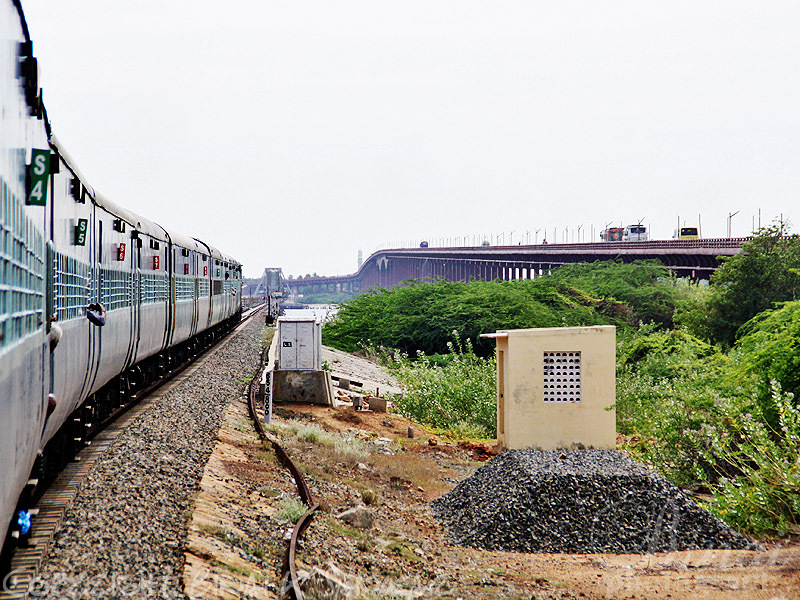 We finally pull into Rameswaram station at 0942hrs – late by 27 minutes. The railways possess a lot of real estate here – the station yard is humungous considering the traffic handled. There is a coach care unit here, complete with pit lines and sick lines! We had a fairly long walk to exit the station – like in every station, almost all the passengers have to pass by the preying auto-drivers. 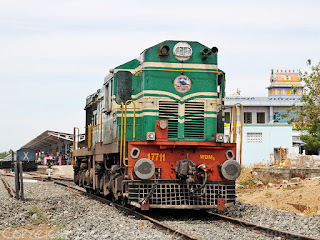 We took some snaps of the loco, and headed straight to Rameswaram temple. That was the loco which worked our train.. It was a 3 hour ride – that took 3 years to mature from the drawing board to reality! The first ever proposal to travel on this line was made in 2009 – and it realised in 2012! We planned, re-planned many time. This time the plan was drawn just about a week in advance – all the travel (except this train part) was by bus. We had initially planned to take the midnight train from Madurai – but later opted for the Tirupati - Rameswaram Express since both of us desperately wanted to sleep the previous night. This journey allowed us to enjoy the ride over the bridge in broad day light. 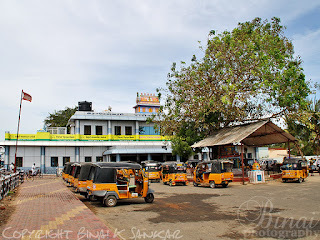 Although we had initially planned to spend the entire day at Rameswaram – the heat and sleepless nights earlier took a toll on me, and we had to cut short the trip and return past noon. Three years to mature – but was nevertheless worth waiting! RIP all those unfortunate soul who perished along with the train in Pamban during the 1964 cyclone..Good narration Binai.. But this wasn't that detailed as your previous outings.. Any ways always refreshing to read..